Eugene since his playing days has slowly edged into coaching throughout the pro tree working with current Eagles head coach Doug Pederson, and also respectable offensive line coaches Juan Castillo and Howard Mudd . From 2010-2012 his title with the Eagles was Assistant Offensive Line Coach. He served in the same capacity with the Chiefs from 2013-2015. Afterwards Chung rejoined the Eagles under Pederson and now serves as the Assistant Offensive Line Coach/ Tight Ends/ Run Game Coach. I had considered sending out this card to Eugene for sometime as I needed it for the set, but something else always came up. D-Rock, a respectable collector from Sportscollectors.net remembered that I was an Action Packed fan from years ago, and out of the blue offered to send me one for free. He said that the person who originally got the autograph was going to throw it out because there was a slight smear. (That’s just terrible.) We both agreed that it’d be something that we’d add to our collections regardless. It just so happened that he also wanted one of the Hart Lee Dykes autographs I got. The cards that were returned to me were not mine and I wasn’t particularly attached to the Upper Deck 1991 (it’s a terrible photo) so I offered to send it in exchange for Eugene’s autograph. It meant a lot to me that he remembered me and I was glad to trade him this card he needed for his set as well. 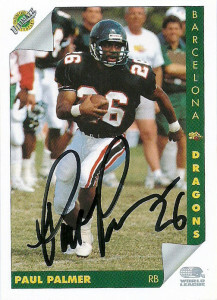 Paul Palmer was a record setting back for the Owls as he singlehandedly put the program in the National spotlight during mid 1980’s. He’d finish as the 1986 Heisman Trophy runner-up to Vinny Testaverde, leading the nation in rushing yards (1,866 yards) and all-purpose yardage (2,633). His improbable 239.4-yard all-purpose average still ranks fifth in college football history, and at the time, Paul’s 349-yards against East Carolina in 1986, was the 4th highest single game rushing yardage in college football history. When he graduated, Paul had set 23 school records and held every major rushing and all-purpose yardage mark. A unanimous All-American selection that year, he was also named the 1986 East Coast Athletic Conference Player of the Year. the Seahawks. To illustrate how monumental his achievement was, no Chief had led the AFC in returns since Dave Grayson way back in 1961, when the Chiefs were known as the Dallas Texans. In total, Palmer had 1,105 all-purpose yards in 1987. 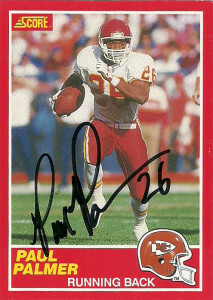 The Chiefs started Paul in 11 games in 1988, using him creatively as a receiver both in the flat and out of the backfield, but Palmer got suspended for conduct detrimental to the team, after he was involved in an argument with coach Frank Gansz’s staff. At the time Paul’s yards from scrimmage were second in the NFL to only Eric Dickerson. He’d be suspended for two games, and return to play, but only marginally. With less of an emphasis on returning kicks, Paul had 53 receptions for 611 yards and 4 TDs, while also contributing for 452 yards and 2 touchdowns. Again, he cracked the 1,000 yard barrier with 1,427 all-purpose yards. After the season, the Chiefs fired the staff and brought in Marty Schottenheimer, who did not feel that Palmer fit his system. 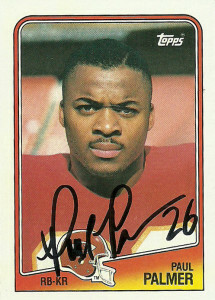 In 1989, Palmer was cut by the Chiefs and signed with Detroit. Moving to a Run ‘N Shoot format, Detroit hoped to use him in relief of Barry Sanders out of the backfield, or as a receiver, but he was relegated to just being a return man. That’s when Palmer became a part of one of the biggest megatrades in NFL history. With the Cowboys struggling and looking to change things up, they decided to trade Herschel Walker for a bevvy of draft choices and players, to the Minnesota Vikings. The problem was, it left a gaping hole at runningback. No problem there as the Vikings were willing to trade Darrin Nelson to the Cowboys, but Darrin didn’t want to play for the hapless Cowboys and refused to report. Uh oh, we have a problem. So the Cowboys traded Nelson to San Diego, and the Lions traded Paul Palmer to the Cowboys for an 8th round pick. 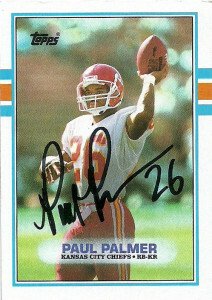 at least moderately confident that the running game was in the respectable hands of Paul Palmer. irony, Paul has revealed in later interviews that he grew up a Redskin fan and cheered against any team that beat the Cowboys. Then he found himself playing for them, which changed his tune.) Paul’s heroics though was overshadowed, by not only the sheer relief that Dallas fandom felt in getting that one win under their belt, but by the fact that it was Steve Walsh, and not Troy Aikman, who was the signal caller that was under center. 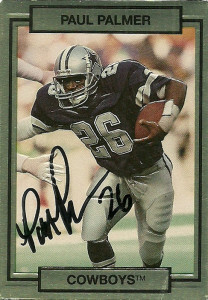 The next week Paul had a career high 22 carries against the Cardinals, but the Cowboys would not win again for the remainder of the 1989 season. He’d finish the year with a team leading 446 yards and 2 touchdowns rushing. 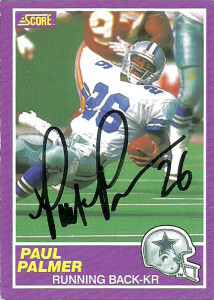 Paul was one and done with the Dallas Cowboys, perhaps by the play of his biteless offensive line, (as he failed to gain at least 20 yards in 4 games during the backhalf of the season,) or that the team sat him in the final contest in favor of Broderick Sargent and Daryl Johnston. -You see if he hit 500 yards, the squad would have owed him a bonus. Paul thought nothing of it, and felt he was going to be a part of the turnaround that the team was going to experience. In fact, assistant coach Butch Davis told him so. He’d be left unprotected by the squad after the season. Snubbed by the Cowboys, he signed with the Cincinnati Bengals. It probably is of no comfort that for Paul’s Cowboy career, he is relegated to being the footnote between Herschel Walker and Emmitt Smith. In 1990, Palmer looked forward to new scenery with the Bengals, but with a stacked backfield of Ickey Woods, James Brooks, and rookie Harold Green, Palmer failed to make the squad. 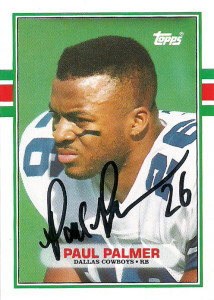 Palmer was often misused by NFL teams at the time. At 5’9″, 180, he was too small to be used as a 3 down back or as a heavy workhorse. His future lied in the field today that is occupied by guys like Darren Sproles- but then with the whole bruhaha that occurred in KC when he got labeled a bad teammate, – odds were just stacked against Paul in the NFL. In 1991, Paul was eager to prove his critics wrong and get back to playing football, and the fledgling WLAF provided that opportunity for him to get back on solid footing. He was genuinely excited for the league draft. 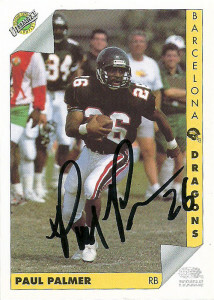 He wouldn’t have to wait long as the Barcelona Dragons drafted Paul in the first round of the league’s positional draft with the third pick. Head coach Jack Bicknell believed in Paul, and through the 4th game of the season, he ranked 2nd in the WLAF with 319 yards on 76 carries, including a 133 yard effort against Raleigh-Durham. An injured hamstring limited his effectiveness throughout the remainder of the season, but he still helped the team finish at a strong 8-2 and play in World Bowl I against the London Monarchs. Paul’s performance was strong enough that he’d be signed by the Philadelphia Eagles after the season ended, but at training camp, his concerns about playing time were blown out of proportion by the media. He did not make the squad. Sacramento Surge. After the season, the WLAF went on hiatus, not to be seen again, until 1995 , strictly in a European format. Paul returned to the United States, and was involved in sideline reporting for the Temple Owls from 2001-2004. He then worked at the High School level, coaching football at Haddon Heights. Palmer proved that you can indeed go home, as he has been welcomed back to Temple to handle color analysis for their radio broadcasts in 2013. Paul absolutely deserves merit into the College Football Hall of Fame, especially in this changing landscape of the NCAA today. It was revealed many years ago, that in Paul’s senior season at Temple, he took a $5,000 interest-free loan from agent Norby Walters. The Owls were harsh in their punishment, stripping him of 16 school records and forfeiting the team’s six wins from the 1986 season in 1989. Still Boo Boo is revered by the Temple faithful, and is still considered quite the legend at the college, where you can’t talk about Heisman hopes without bringing up his name. Palmer had been one of my more frustrating payoffs. After not finding a trace of him on the internet, I threw up a hail mary to Temple, thinking that they might have an alumni association. Unfortunately they sent me back a letter telling me that they didn’t have an alumni department, nor did they know how to locate him. I then decided to put an all points bulletin out for him through Sportscollectors.net, where a kind collector assisted me in locating a working address for me. One of my best responses ever, Paul was certainly worth the wait. I only sent him 4 cards, but he actually added 6 additional signed cards! Of note, one of the cards I had him sign is the rare Ultimate WLAF promo card (with the yellow stripe) that was given away at the WLAF games in 1992. These 10 cards represent every card pro card of his printed during his tenure in the professional ranks. 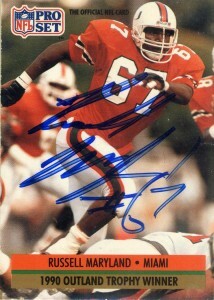 Russell Maryland while at the University of Miami had played for Jimmy Johnson before he jumped to the NFL in 1989. 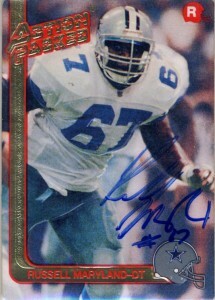 Maryland would cement his status as the strongest defensive line prospect in the 1991 draft by winning the UPI Lineman of the Year award and the Outland Trophy in 1990. In that season he’d make 96 tackles and 10.5 sacks for the Hurricanes. 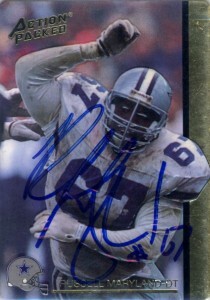 The Dallas Cowboys traded up in the draft in 1991 so that they could acquire Russell Maryland to play right defensive tackle with the #1 pick in 1991. In order to grab him the Cowboys traded starting middle linebacker Eugene Lockhart, defensive back Ron Francis, linebacker David Howard, their 2nd round pick and Minnesota’s first round pick (that Dallas had gotten in the previous season in exchange for Herschel Walker). At 6’1″, 300, I was very confused by the fanfare that surrounded Maryland who while he improved the Cowboys defense to some degree and helped them win 3 SuperBowls, -failed to be an impact as a pass rusher or run stopper statistically. 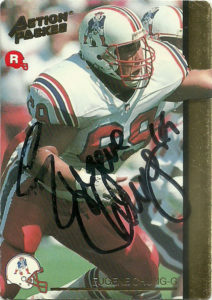 In fact his statistics ended up being somewhat pedestrian as he never had over 5 sacks or 60 tackles in 10 seasons. In retrospect, Maryland was a decent lineman, but certainly not worthy of the impact blue chip #1 slot typically reserved for draftees. In 1993 Russell would earn a Pro Bowl nomination after he made 56 tackles, 2.5 sacks and 2 forced fumbles, but by 1994 he was already splitting time in a platoon with other defensive linemen and shifted to left defensive tackle which would further impact his numbers. In 1996 Maryland would sign via free agency with the Oakland Raiders. He’d start 16 games 3 times over the next 4 seasons for the Raiders (- a feat he only accomplished once in 5 seasons for Dallas). He’d tie his career high in tackles in 1997, and sacks with 4.5. 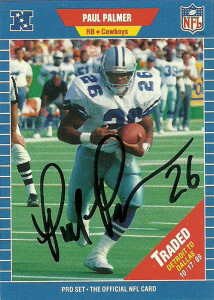 I’d get Russell’s autograph at Dallas Cowboys Training Camp prior to that season as the Raiders visited on his Action Packed Rookies 1992 card. He’d play with the Raiders through 1999, then sign with the Green Bay Packers where he notched his first career safety and retire after the conclusion of the 2000 season.